Lot 65: Swoon Creations - A giveaway! Swoon Creations - A giveaway! I'm so excited to start this week off with another giveaway, this time from a fabulous - and local! 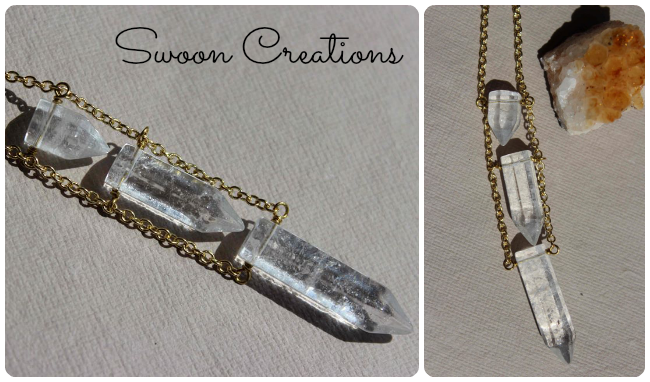 - jewelry line, Swoon Creations. I was so excited when Swoon's designer, Savannah, offered up one of her gorgeous gemstone pendants - because I think they'll add the perfect touch to so many different outfits. A seriously fantastic accessory for summer or fall, I think. You can check out the Swoon Creations etsy shop, or if you're an Islander, pop in to Green Eye Designs on Victoria Row in Charlottetown to check out the beautiful baubles on display. So worth the visit! This giveaway will be open from now until next Monday, and there are a myriad of ways to get your name in for this lovely pendant. Check out widget below for more details! The gemstone pendant necklace is my fave...I spied a beautiful greenish one at Green Eye the other day and I didn't pick it up. I couldn't stop thinking about it so I went back, and much to my dismay, it was gone :( Heartbroken! They have beauty stuff! I love the porcelain piece, such nice colours!